Smart glasses were all the rage a few years back, especially when folks thought that Google Glass was going to kick off a whole new revolution in the consumer electronics market. Unfortunately, things did not pan out that way, and the utopian dream of everyone wearing a pair of smart glasses continue to remain just that: a dream. However, the situation is rather different when it concerns the enterprise market, as Vuzix has entered new territory with the Vuzix M400 enterprise smart glasses. What makes the Vuzix M400 enterprise smart glasses so special? For starters, the M400 carries the proud distinction of being one of the first products that was made commercially available via the Qualcomm Snapdragon XR1 platform. The Snapdragon XR1 platform is crucial to the advancement of the smart glasses platform, since it integrates Qualcomm Technologies’ heterogeneous computing architecture that comprise of an ARM-based multicore Central Processing Unit (CPU), vector processor, Graphics Processing Unit (GPU) and Qualcomm AI Engine. Enabling power efficient on-device processing of vision-based machine learning algorithms, this will be able to further assist with key Augmented Reality (AR) use such as object classification and superior pose prediction. Not only that, the Snapdragon XR1 platform was also designed to deliver an immersive User Interface (UI) experience, and developers would do well within their capacity to take full advantage of features such as native voice processing, motion tracking, and head tracking. While there is no word on pricing as at press time, the Vuzix M400 smart glasses is tipped to enter volume production later this summer. To further add to its appeal, this particular device will be physically, mechanically and for most software fully compatible with Vuzix’s current range of M-Series products. 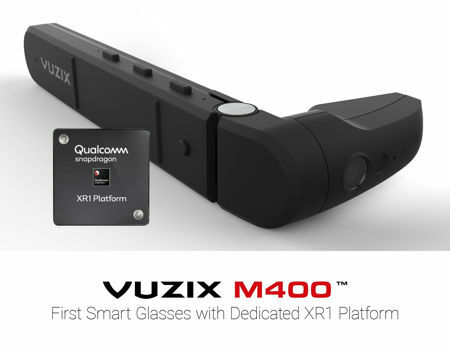 With the latest version of Android running underneath the hood and USB-C connectivity for a degree of future-proofing, the Vuzix M400 is shaping up to be the most innovative and powerful set of enterprise smart glasses on the market upon its release.